There's a strange connection between the exercise of our faith (wobbly though it may be) and the growth of optimistic hope in our hearts. Outrageous faith, Blaine Smith calls it. 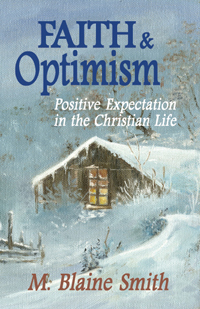 And he explains why, as he examines the role of positive expectation in the Christian life. Blaine believes that faith is the most underappreciated benefit in the Christian life today. Christians who do emphasize faith often take it to an unhealthy extreme--just believe anything can happen and God will accomplish it for you. Yet most Christians don't emphasize faith enough, even though it is upheld constantly in Scripture as the means by which we receive the grace of God and every benefit he provides. "A profound, practical and positive exposition of the importance of living our faith, and in the process, seeing our lives both realistically and with the optimism that comes only from surrender to Christ." "Smith helps readers move from discouragement to hope, learning to win through failure." "Read this book and you will find your misconceptions of faith trashed . . . . The twenty-six chapters make this book an ideal daily devotional."